There are a number of Statutes (Acts), Regulations and Orders that directly relate to the provision and delivery of educational services in Saskatchewan. These legal documents outline how “schooling” is to be governed and operated in the Province and elaborate a variety of salient and mundane topics. Sometimes we have found these documents difficult to access and insufficiently consolidated for practical use. For us, putting this Guidebook together was all about providing an accessible, non-partisan, user-friendly guide to these legal parameters for teachers, aspiring teachers, trustees, school administrators, central office administration, parents and interested community members. Obviously, A Guide to Saskatchewan School Law is not a legal text but rather a non-legal interpretation of the Education Act and a variety of other legal texts for the general informational use of laypersons. WHEN A PARTICULAR LEGAL OPINION IS SOUGHT, A LAWYER OUGHT TO BE CONSULTED. It is also important to note that the information found is this and other guides to school law is subject to change. 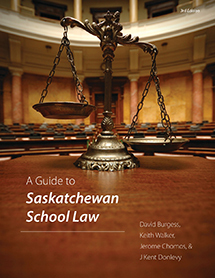 The 13 Parts, and Appendices (14), of this guide are provided as a starting place for questions and curiosities that parents, trustees, new and veteran teachers, school administrators, school support staff, school division personnel, and others may have about the formal elements of school law in Saskatchewan. We have placed the content of Saskatchewan school legislation under a number of themes and headings. PART 1.0: The Student and the School. In this part we provide information on attendance at school, operation of schools, provision for education, types of schools, learning resources and particular programs in Saskatchewan, language and culture programs, special education, and student health and welfare. PART 2.0: Parents and the Community. This part of the guide defines who parents are, their rights and obligations, as well as outlining community use of school facilities. PART 3.0: The School Teacher. This part deals with teacher qualifications and certification, teacher classification, teacher accreditation, the hiring of teachers, conditions of employment, teachers’ duties and functions, teacher suspension, dismissal and other disciplinary action and non-teaching staff. PART 4.0: The School Principal. This section of the guide reviews the qualifications and appointment of principals, their employment status, duties and functions and describes the roles and functions of vice-principals and assistant principals. PART 5.0: Collective Bargaining. Provincial collective bargaining, local collective bargaining, and the settlement of disputes are briefly described in this guide. PART 6.0: Saskatchewan Provincial School System. This section provides a description of the Saskatchewan government department responsible for education (“Ministry of Education”) and outlines the Minister of Education’s duties and powers. In addition, the appointment of ministry officials, the Education Council, the Educational Boundaries Commission, and the legal instruments of the Minister of Education are described. PART 7.0: School Divisions and School Boards. School divisions and school boards are legally described, together with their membership, duties, and powers. Joint Boards, school districts, local school boards, and local school advisory committees are also reviewed. PART 8.0: Administration of School Divisions. The duties of Board chair, director of education and superintendent of administration are outlined in this part of the guide. PART 9.0: The Basics of School Division Budgets. This part of the guide provides an overview of how education is financed in the Province of Saskatchewan. The guide gives a brief description of annual operating budgets, capital budgets, and borrowing powers of Boards. This part of the guide also provides a description of legal status of school property. PART 10.0: Fransaskois Education in Saskatchewan. An overview of Francophone education, its establishment, structures, general program, funding and administration are outlined in this part of the guide. PART 11.0: Aboriginal Education in Saskatchewan. An overview of the key documents, trends and organizational patterns for provision of educational services to First Nations persons in Saskatchewan. PART 12.0: Independent Schools. An overview of the provisions for the registration of independent schools in Saskatchewan, the types of independent schools, the funding, staffing, administration and inspection of independent schools is provided. PART 13.0: Home-based Education Programs. An overview of registration obligations, parental rights and responsibilities, boards of education responsibilities, monitoring authority and funding. PART 14.0: Appendices. In the appendices of this guide, we provide a collection of ethics codes, rights and freedoms documents, federal and provisional statutes pertaining to education in Saskatchewan and key documents that pertain to education in Saskatchewan. Dr. Burgess is Associate Dean (Research, Graduate Support, and International Initiatives) in the College of Education, and Associate Professor in the Department of Educational Administration at the University of Saskatchewan. His current teaching and research interests include philosophy of organization and organizational modeling, educational law, methods in legal instruction and research. Prior to academia, David served as a consultant with the United Nations Non-Government Liaison Service (UN/NGLS) in Geneva, Switzerland. After completing a career as a high school teacher, assistant principal, and principal, Jerome Chomos has spent a number of years as a sessional lecturer in the College of Education at the University of Saskatchewan. He has a continuing interest in the practical application of law in the educational context and continues to write on legal topics for educators. Jerome occasionally lectures and provides workshops on the law in education. Dr. Donlevy is an Associate Professor in the Faculty of Education at the University of Calgary. He has served as a school teacher, principal, barrister and solicitor, and has written extensively in the areas of school law dealing with constitutional and tortuous matters. He is recognized as an expert in school law at the Court of Queen's Bench (Alberta). Kent's primary research and teaching interests are in educational law with a particular focus on constitutional law, negligence, and Catholic education; his secondary focus is on ethics and leadership in education. Dr. Walker is a Professor in the Department of Educational Administration and the Johnson-Shoyama Graduate School of Public Policy at the University of Saskatchewan. His recognized areas of work include educational governance and policy making, leadership philosophies and practices, community and interpersonal relations, organizational improvement and capacity building, and applied and professional ethics. Keith brings to his students and work over thirty years of experience as a manager, teacher, minister, leader, scholar, and educational administrator in public and social sectors.